This is a guest blog post by Emmanouil Konstantinidis, the author of Trevor. 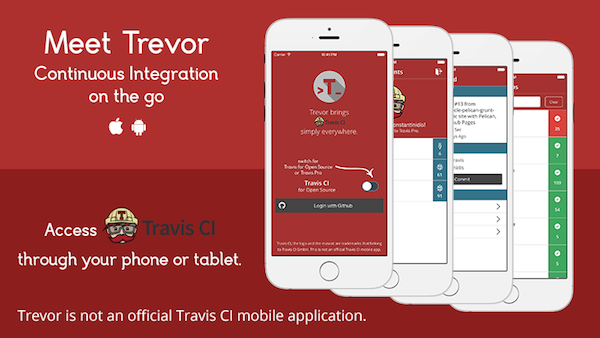 Trevor is a mobile app that brings Travis CI to your phone and tablet. You can download it for free from the App Store and Google Play. It is a hybrid app based on Ionic Framework that utilizes the amazing Travis CI API. Following Ionic since its first releases, while I’ve also used it for a couple of projects(work and personal projects), my opinion is that it keeps getting better and better with the Ionic Community getting bigger day by day. Most of the projects that I’m working on at DabApps involve a mobile app and a web server(Django & Django Rest Framework) and from my experience with APIs I can only say that the Travis API is just perfect. I’m using Travis CI for about a year and when I first read the API documentation, it was pretty clear on how to retrieve everything from accounts to repos, builds, logs etc. Since Trevor started as an experiment (Friday night, let’s give it a try), I believe the app would not be in the stores if the API wasn’t that clear. It all started with the login (which was the toughest part since it involved authentication with Github) but once I got the Travis token, I was then able to get my accounts, repositories, builds and pretty much everything Travis’ web interface provides. A new version has been already submitted and includes many many changes. New improved design (inspired by the new awesome Travis UI), ready for Travis CI for Education, many fixed bugs and of course it’s more stable and faster. I plan to add more features such as access to both Travis CI for Open Source and Travis Pro at the same time, push notifications and more! Download it for free and watch for the upcoming updates!